A total of 24 referees (both Assistant Referees and Referees) participated in this workshop at Loto Tonga Soka Center in ‘Atele along with TFA’s three instructors, Haina Moli – Referee Instructor, Koliniasi Vakatapu – Referee Instructor and Tevita Latu – Referee Fitness Trainer. TFA’s Referee Development Officer, Tevita Vea sat in as an observer. This workshop which includes theory, practical and fitness components is to assist TFA raise the level of football specifically in refereeing. In congratulating course participants, Oceania Football Confederations (OFC) Referee Development Officer, Massimo Raveino who heads the FIFA Referee Assistant Programme (RAP) reminded referees that although the workshop wraps up, football development in to Strives on. ” We are at the start of a new process of development of Referees but we have to remind ourselves our duties. Our responsibility is to serve the general interest of Football and serve the general interest of Tonga Football Association” Raveino said. 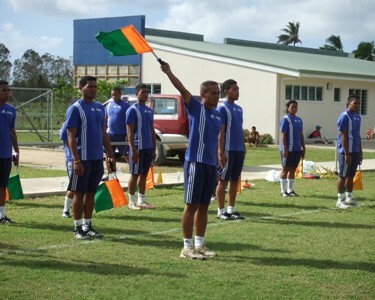 The success of TFA’s refereeing is reflective in the recent selection of Tevita Makasini to officiate at the FIFA world Cup in South Africa in June this year and Lata i sia Tuifutuna for the 2011 Womens FIFA world cup. Lata who is due back in the country later this month, is one of two OFC women referees who had successfully undertaken FIFA fitness tests at the Algarve Cup in Portugal last week and passed with flying colours.